Hello guys, thank you everyone who read and like this FF. Thank you Jasmine and Lana. 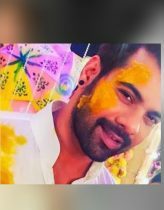 Three days later, Abhigya, Abhinav Sangya and Purab Disha Haldi takes place. All 6 wore a white dress, which is perfect combination of Yellow coloured Haldi. Happiness flow into their house. Ronnie applied Haldi all over their faces and dresses. He makes fun of them. Next day, Mehandi ceremony. Pragya, Sangya and Disha where busy in applying Mehandi. Abhi, Abhinav and Purab dance infront of them. Pragya, Sangya and Disha smiles at them shyly. Next day, Sangeet. Now, Pragya, Sangya and Disha dance infront of them like a peococks. Tu Na Ho To Main Bhi Nahin..
Next, Dadi and Ronnie danced, then Sarla and Raghu Veer danced. All guests danced. Happy moments. Next day is their wedding. Three couples sit in an order. They did everything as like Pandit ji told. And they take pheras. Atlast boys tied mangalsutra in girls neck and apply sindoor in their hairline. Pandit ji announced marriage is completed. There is happy tears in Rakesh, Sarla and Raghu veer’s eyes. Dadi is smiling happily. All couples smile happily as well as they are sad. Because next day, Pragya, Sangya and Disha has to leave their family. But for that moment they wish to forget that. Night, Abhi enters Pragya’s room. Pragya is sitting in bed. He went near to her and removed her veil. Both smiles at each other. Pragya(voice trembles): yeah, even i too never dreamt that i have to leave my family this much soon. That too that far, from where i can’t come to see my parents whenever i think. Abhi(felt sad): yeah, even me too worrying for that. I can understand your pain. Because, hereafter Disha won’t be there with me to fight with me. It’s really crucial that girls should separate from parents with whom they live for nearly three decades. Tear drop escaped from his eyes. Abhi: i promise you Pragya, just one year after to that whenever you wish, i will take you to India. If you wish, we will settle here itself. Pragya: I am not that much selfish. She smiles at him. He hugged her. Sangya is crying like a kid. Abhinav too sad. Sangya: Till date, i never stayed one night without my mom and dad. I never went to any school and college tours. But now, i am going away from them for my whole life. Abhinav: Sangya, don’t cry na please. Just 1 year. After to that we will settle here itself. Sangya: then how you will see your dad and brother? No need. She wiped her tears. She went to balcony. Abhinav stands beside her and hold her shoulder. She lie her head on his shoulder. Silent tears escaped from her eyes. Abhinav: see Sangya, no one will be with us for long. When you are studying college, your school friends wouldn’t be with you. When you are in work, your college friends wouldn’t be with you. Like wise only all. Life won’t be to your favourite always. There will be sadness too. You have to be habituate to it. One day i won’t be there in world. (Sangya keep her fingers on his mouth and shook her head. He hold her fingers and kissed it.) It’s reality Sangya. When i am not with you, you shouldn’t stand in the same place and cry like a kid. You should move on in your life. She kept her face on his chest and cries. He pats her head. Purab: You have belief on me na. ( Disha nods) Then, i will take you once in a week to your home, if you wish. Purab: If i can’t able to come means also, you can go with Ma, dadi and Papa. Disha: then, i will miss you. Purab: then, how you can see your dad and brothers often. I have to do work. Disha: you are thinking so much for me. Even you will miss your sisters but you are consoling me by hiding your feelings. I am so lucky to have you in my life. Once in a month we will visit them. That too, if you are free means only. Because i don’t wish to miss you for a single day. I will miss my dad, Abhi bhai and Abhinav bhai. But i used to it. So if i met them atleast once in month means i never felt like i am separated from them. Purab smiles at her with tears and pecked her fore head and hugged her. Next day, morning. Whole house is busy in packing and unpacking. Everyone is roaming here and there. Sonehow, they finished packing. Now it’s time to leave. Everyone’s eyes become pool. Pragya hugged her mom, dad and dadi. Then Sangya hugged them. Here Disha hugged Her dad. Abhi and Abhinav together they hugged Disha. Tears fall from their eyes. Pragya and Sangya hugged Purab with tears. All went to airport. With heavy heart abhigya and Abhinav Sangya board the flight. Purab and Disha returned home. The home which looks as small village for past three days now looked emptied. Sarla is fixing her kids marriage photos in wall with tears. All are silent. This is not happy ending. I will give epilogue to this. That will be happy reunite of two families. The post Twin Love (AbhiGya) SS Part 8 (Last) appeared first on Telly Updates.